Jerry Ratcliffe and University of Virginia (UVA) athletics go together like Hilldrup and moving; in fact, they’re pretty much synonymous. Jerry Ratcliffe, who has provided the very best coverage of UVA athletics and the Atlantic Coast Conference (ACC) for 40 years, recently brought his passion for sports journalism all to one place: JerryRatcliffe.com. Looking to pursue sponsorships with long-established companies that are recognized and trusted across Virginia and beyond, Jerry looked no further than Hilldrup. 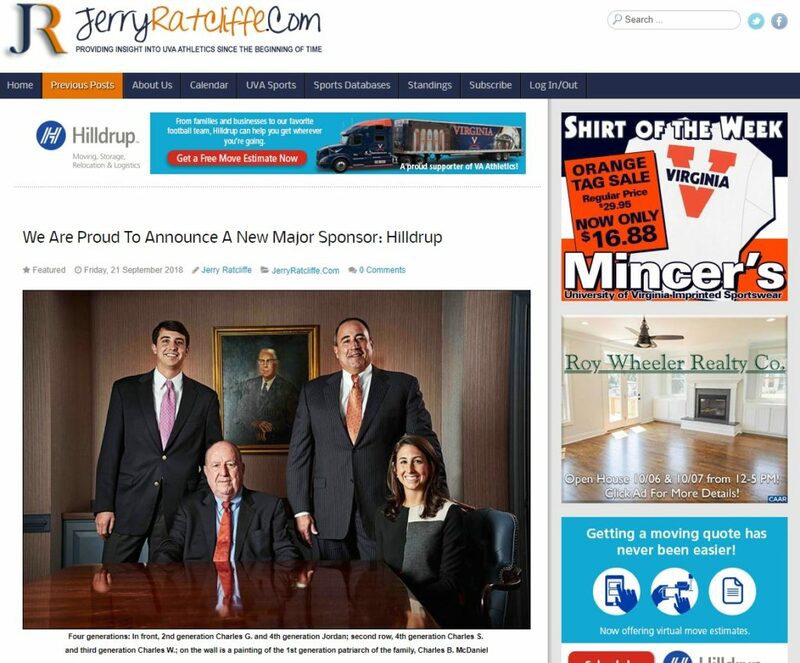 We’re thrilled to announce that Hilldrup is now a proud sponsor of JerryRatcliffe.com! From our President and CEO, Charles W. McDaniel, who remains the third-leading linebacker in UVA history, to transporting the University’s football equipment and relocating UVA’s athletic director, Carla Williams, you could say we’re pretty big fans of UVA athletics here at Hilldrup. Jerry Ratcliffe would know. Jerry has been a UVA sports writer his entire career and has been “providing insight into UVA athletics since the beginning of time,” according to his website. Recently, Jerry launched his self-named website to cover all things UVA sports and beyond. And he takes his job and passion for sports writing seriously: Jerry has covered every ACC Basketball Tournament since 1974, more than any other sportswriter in the nation! As a sponsor, Hilldrup is proud to support the wit, knowledge and passion for sports that is evident in Jerry’s sports analysis coverage throughout his website. Check out Jerry’s introductory post about Hilldrup’s sponsorship and coverage of all things UVA on his website here! Jerry Ratcliffe, renowned UVA sports writer, recently launched his own, self-named website to cover and share all things related to UVA athletics. Hilldrup is now a proud sponsor of Jerry.Ratcliffe.com and was recently featured on the website introducing us to his readers!